We did it…We Won…We really won! 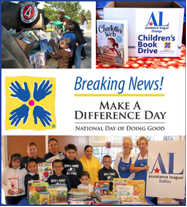 We have just received the news – Assistance League has been chosen as one of ten National Honorees by USA WEEKEND and Points of Light for its participation in Make a Difference Day 2012! We – 21,505 member who collected an astounding 113,101 children’s books and shared heartfelt stories about the children in schools, shelters, clubs, and our individual programs of assistance within our commuities. .
Our collective message was powerful! We know Assistance League makes a difference every day, but now approximately 47 million readers of USA WEEKEND in mid-April will discover it for themselves. Assistance League of Metro Columbus is proud to be one of the Assistance League chapters featured in this USA Weekend article. In less than two weeks we purchased over 165 books to give to individual foster children in the Children’s Services of Ohio Annual Convention held the end of October. These children often have only the clothes on their backs when they arrive at foster care. Many leave foster care with little more…only the clothes that currently fit them. They have nothing of their own, to hold, to treasure, to take with them as solid proof that someone somewhere cares! Congratulations to all for our outstanding success, for this national recognition, and for continuing to make a difference!